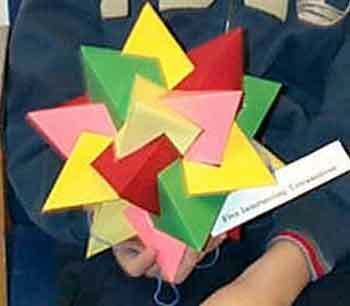 Teachers can find lesson plans and instructions for these projects here. Oak Hill 8th graders completed construction of 3-d shapes as an investigation of what could be made from regular, 2-d shapes. 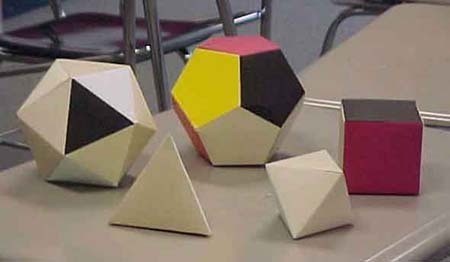 They compounded, stellated, and truncated the 5 Platonic Solids which are shown below. 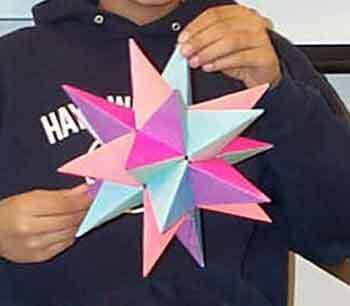 Andre made a stellated icosahedron. Notice that each point is a different color ... very unusual and attractive. Ben made 5 intersecting tetrahedron. You can see almost the entire green tetrahedron. Ben made a Great Dodecahedron. Notice that we are looking at a black pentagonal face with a star shaped cookie on top. If you view this polyhedron from the left, you see a purple pentagonal face with another raised cookie. 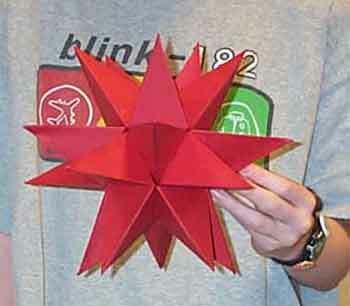 Cas built a totaly red stellated icosahedron. 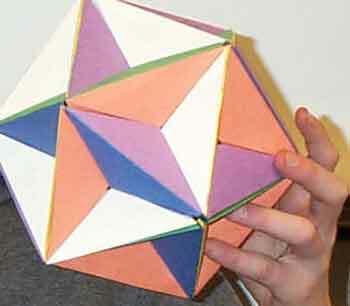 An icosahedron has 20 faces. So this is what you would get if you put a point on each face. Catherine built a Great Dodecahedron. You can see a yellow, pentagonal face to the left and front. There is a light turquoise face on the right hand side. 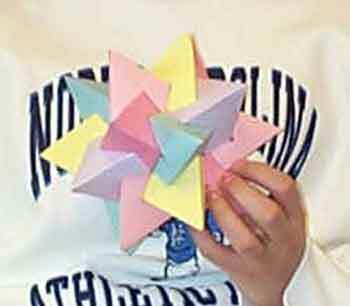 Diana also made a Great Dodecahedron. We can see her pink, yellow, and pale green pentagonal face very clearly. Beautiful. 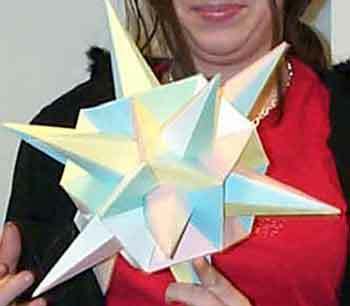 Dina made a Stellated Icosahedron. You can see a pink pentagram (5 pointed star) in the background of the figure. 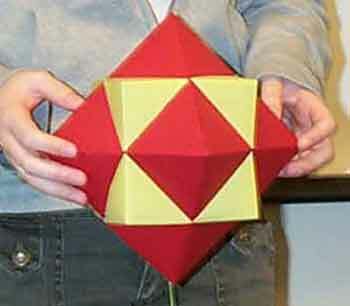 Looking at the polyhedron from the left, you can see a red pentagram. Beautiful! Emily made a Stellated Icosahedron in different shades of blue. Beautiful ! Erica made a stellated icosahedron. Notice that from the left view you can see a pale blue 5 pointed star. From below and to the left, you can see a purple star. From the front you can see a pink star. Neat ! 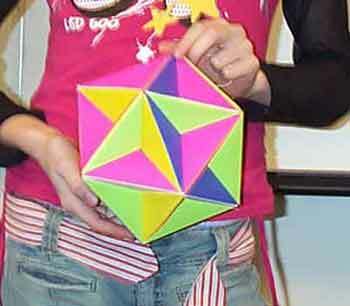 Esther also made a Great Dodecahedron. Beautiful ! 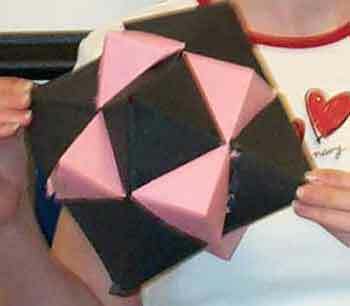 Francesca made an octahedron (black polyhedron) pierced by a hexahedron (pink cube). Frank made a Truncated Icosahedron. 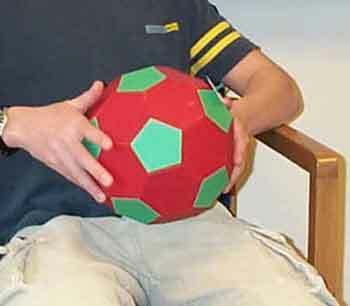 This ball-like shape is made from pentagons and hexagons. 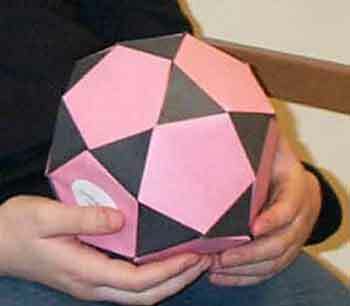 The other name for this polyhedron is a soccer ball. 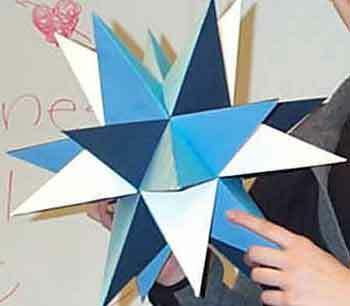 Greg made a Stellated Icosahedron. He is holding it to show the green pentagram (5 pointed star) that is in the back plane. From above we can see a yellow star. and, from below, we can see a dark blue star. Gyu made an incredible Great Icosahedron. This figure contains 120 individual pieces to accurately cut and glue together. Awesome! 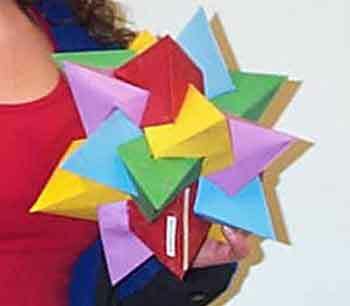 Jackie made the Sixth Stellation of the Icosahedron. I think it look like a medieval weapon? Jake made a Great Dodecahedron. Jenn created a Dodecadodecahedron. From the front, we can see an orange pentagonal face with a parallel face that contains an orange pentagram. In the same way, the red pentagonal face on the left has a raised, parallel, red pentagram face. Cool ! 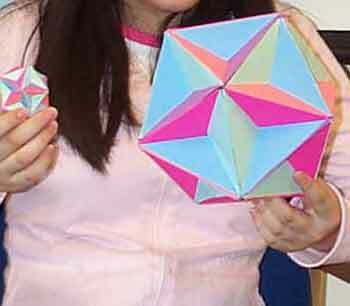 Jenny made two perfectly matched tiny and large Great Dodecahedron. Very fun ! 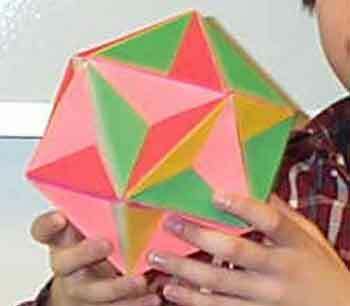 Jeremy created a beautiful Great Dodecahedron. 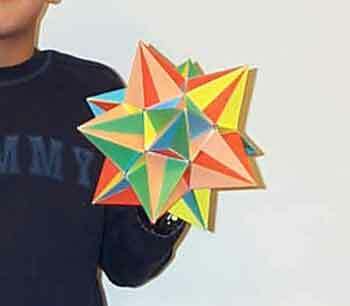 Jonathan made a Stellated Octahedron. 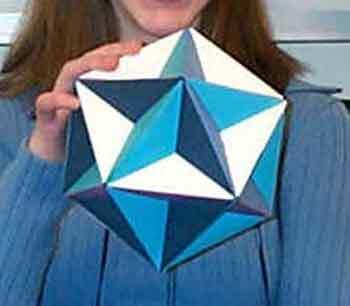 Imagine an octahedron and place a point on each face. Voila ! Juhin made two intersecting tetrahedron. You can see almost the entire yellow tetrahedron. Kamerry had a hard time with this creation. 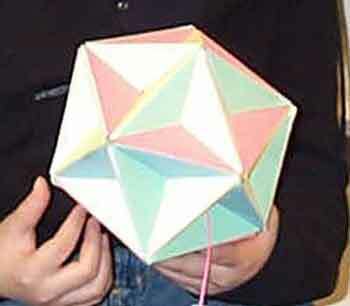 It is a Small Dodecahemicosahedron. Very hard to do. Great job. 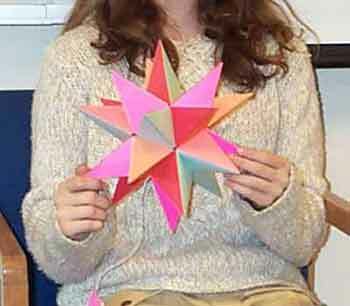 Kayleigh made a beautiful Stellated Icosahedron. Notice that you can see a green 5 pointed star facing left; a yellow star facing up; and an orange star facing the camera. Isaac made a beautiful Great Dodecahedron. Notice that we are looking at an orange pentagonal face with a star shaped cookie on top. From the left you can see a white pentagonal face. From below you can see a dark blue face and from above, right, you can see a lavender face. Kristina made an outstanding polyhedra. 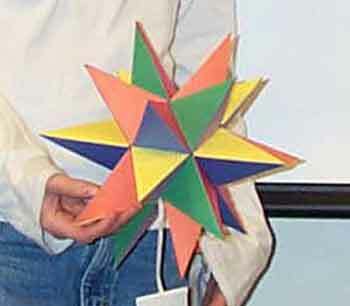 This is the Sixth Stellation of an Icosahedron. Pretty amazing ! Lauren made a pastel rendition of 5 intersecting tetrahedra. You can see the yellow tetrahedra almost completely. Leslie gave her Great Dodecahedron some extra visuals. Lily made an Icosidodecahedron. 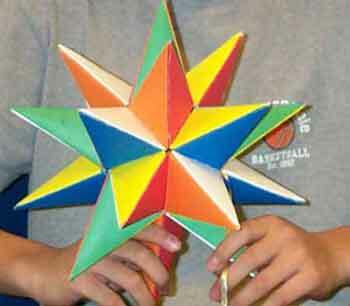 The name means that it is a combination of an icosahedron and a dodecahedron. 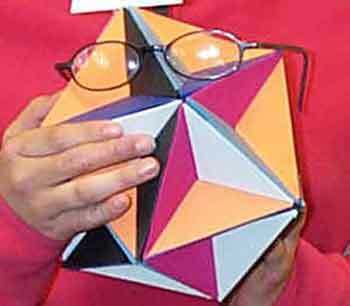 Lin made a very difficult polyhedron. 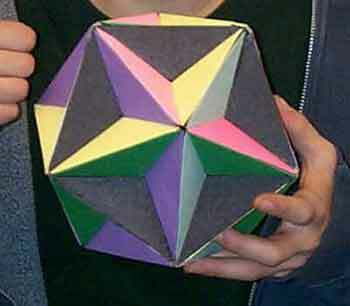 This is called the Great Icosahedron. This is a confusing polyhedron to build but Lin did a perfect job. Awesome! Marina made an incredibly beautiful mobile. 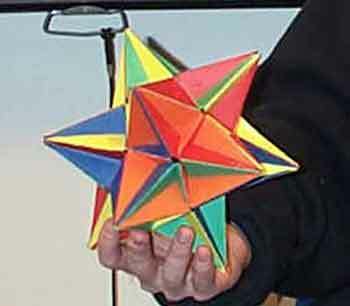 She dangled five, two intersecting tetrahedra from fine strings to make a beautiful piece of art. Matt made two intersecting tetrahedra. You can see the light blue tetrahedra almost completely. 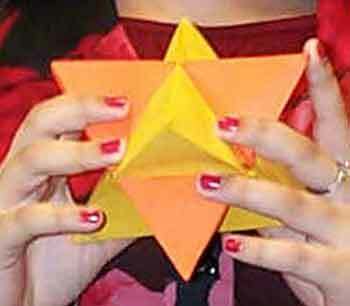 Mayaan wanted to create a 3-d Star of David. I think he did it beautifully. 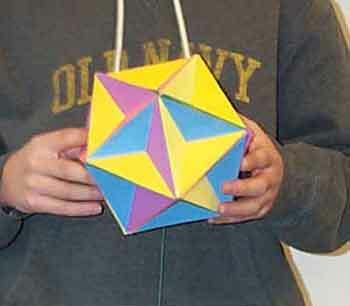 Oleg created a Great Icosahedron. This figure contains 120 pieces that need to be accurately cut and glued. The color arrangement is frustratingly difficult. Oleg did a marvelous job. 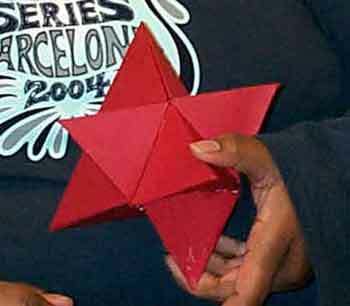 Sade made a Stellated Octahedron. 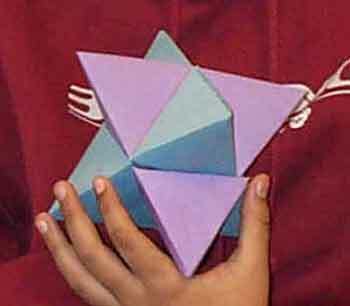 Imagine an octahedron (8 faces) with a point attached to each face. Sara made an Icosidodecahedron. 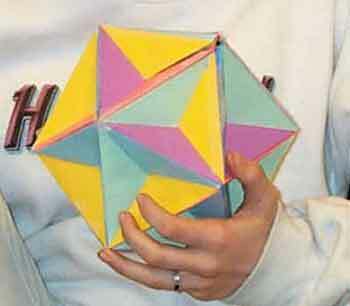 It's name implies that it is a combination of an icosahedron and a dodecahedron. Beautiful ! Sarah made a Great Dodecahedron. She used only shades of blue. 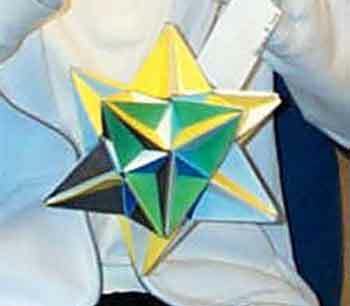 You can clearly see the back, white, pentagonal face with a raised blue star-shaped cookie on top. From the bottom right, you can see a light blue pentagonal face. From the bottom left you can see a dark blue face. Gorgeous ! 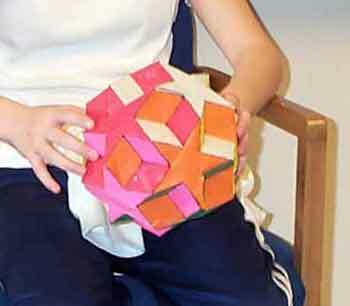 Sari created a model of 5 intersecting tetrahedra. You can see a yellow tetrahedra almost completely. Beautiful! 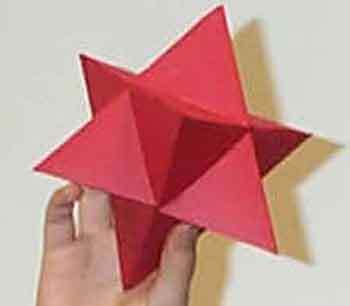 Shir made a perfect model of an Octahedron (red, eight-sided figure) compounded with a hexahedron (yellow, six-sided cube). 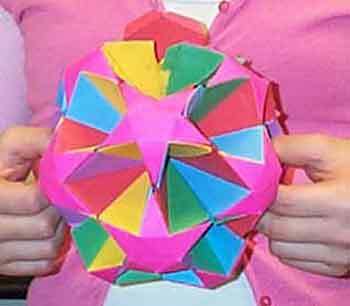 Stephanie made a beautiful, pastel, Great Dodecahedron. Steven must have been enjoying himself. He created two amazing figures. 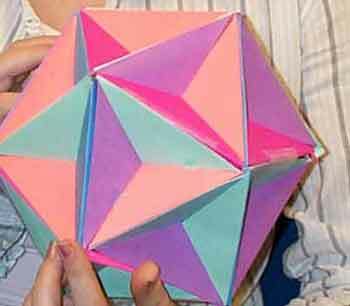 The figure on the left is a lovely Great Dodecahedron. 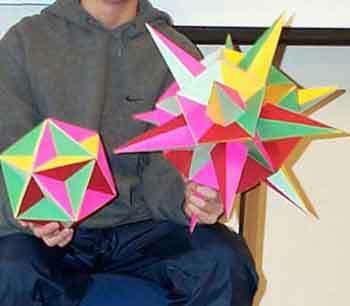 The polyhedra on the right is the sixth stellation of an Icosahedron. awesome ! Josh made a beautiful model of 5 intersecting tetrahedra. 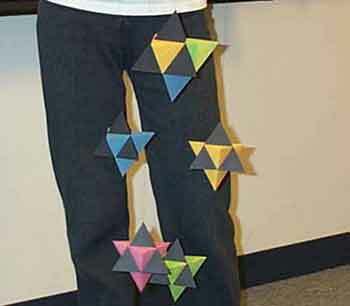 We can see the green tetrahedra almost completely. Very neatly done! 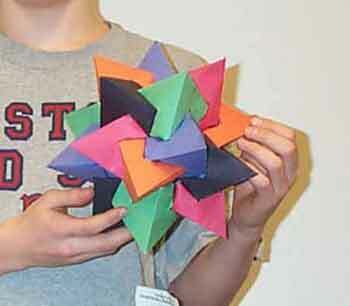 Travis made a lovely model of five intersecting tetrahedra. 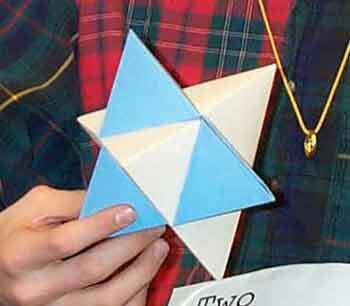 We can see a green tetrahedron almost completely. Beautifully constructed! To visit other math and art sites by Leslie Lewis click here.